The car and I haven’t yet hit the “pull out the ice scraper” zone. But seriously – one of the top questions I get on the road is how EVs perform in the winter. Although I can speak from what I’ve read online and the stories of fellow EV drivers, I haven’t yet experienced a North Dakota winter in the electric car. Real world data is one of the main reasons Minnkota added an all-electric vehicle to its fleet. So we aren’t going to leave the Bolt in the garage once the temperature dips below zero. We’re getting it on the road, and we’re going to be real about the challenges we encounter. We hope the challenges will be few – but there’s only one way to find out. In the meantime, as I wait for the flurry of flakes, here is some knowledge I’ve gathered so far. 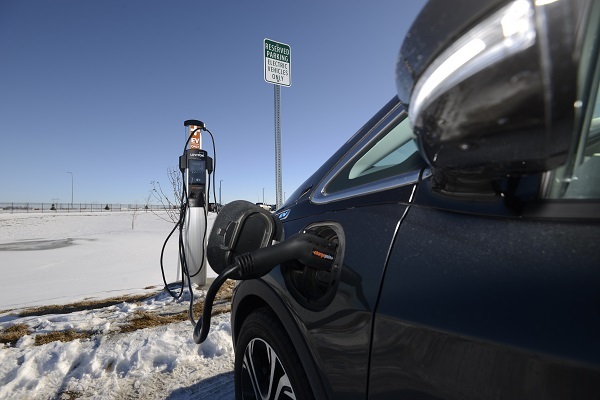 Electric vehicle performance and range does decrease in the cold winter months, but it also decreases for gas-powered vehicles. EV range can decline up to 40 percent in the coldest temperatures – a combination of using battery power to heat the cab and the decreased efficiency of lithium ion batteries in the cold (just like your smartphone). EVs actually have a better chance of starting in the cold than gas vehicles. Being plugged in and utilizing the built-in battery conditioning system keeps the battery warm and ready to rip. Because the heavy batteries of EVs run along the floor of the vehicle, the car’s center of gravity is low. That, combined with the front-wheel drive of many models, makes them great for traction and control on ice. Norway has the highest EV adoption rate of any country – over half of new car sales there are now all-electric or hybrid. They experience harsh winters like ours, and they’re getting along just fine! If you have any questions or concerns our team should cover in the coming cold months, reach out!